I recently ran across a photo from 6 years ago. It made me giggle. It made me roll my eyes. Once, I was gifted the wonderful opportunity of participating in a body modification celebration and performance. It was exhilarating. It was a flop. Not the show – that was beautiful. But my little part in it. My part was confusing, at best. I’d spent the pre-show time getting my neck rigged up. Sounds weird, I know. But it was really nothing more than thin gauge play piercings in a pattern so that, threaded with ribbon, it created a collared look. The effect is actually referred to as an “Elizabethan Collar”, and it was pretty darn neat. Mom, look away. I know this gives you the willies. With two other performers, I practiced our short part of the performance in the days leading up to the show. Walk on, turn, lights, music, dance, showcase scene behind us, lights, circle, turn, walk off. Easy peasy. But the “producers” of the show hadn’t seen our little act yet, and the night of the show decided to change things. One told me to “circle the stage”, making my way around the other people. Another told me to stand completely still, letting the black-lights “do the work”. When showtime was called I thought I’d figured a decent compromise between the two instructions. Um… no. Up on the stage, I circled to my designated space smack dab center-front, began to move slightly, and heard a sharp whisper in my ear. “Just stand still!” So I stood still. Seconds later I heard, “move your ribbons”. So I wiggled my chin around, displaying the collar. Halfway through our spot another voice, louder, tells me to move back toward the play scene behind me. So I walk backwards, moving my arms and the ribbons on my neck, trying not to bump into anyone. I’m nudged by yet another person, and told to scoot up. So I did… back to my original spot, where I planted myself and smiled to the crowd. That was it – smile big. In my mind, my arms were crossed in front of me, I had a pouty face, and I was saying, “fine!” To everyone else watching, I was a smiling collar-head, occasionally moving a wrist of ribbons, occasionally turning my head from side to side, glowing in the dark. Off stage, one producer asked, “did you choke up there? You weren’t moving.” And the other said, “you did great, but I was hoping you’d look more like a statue. Less movement.” And that was it – I’d had my chance, had some fun, had some frustrations, and am likely to never return to that stage. 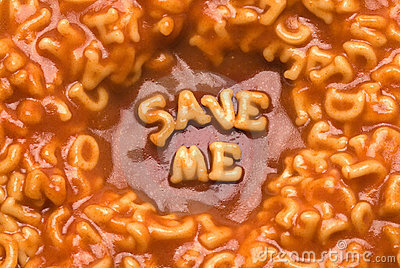 Or, as in this photo, the Alphabet SpaghettiOs. What’s the point of my drawn out story? How does it relate to writing? Once you find an editor, be done. Once you have an agent, don’t do anything unrequested with your work. Be done. Do nothing until your agent instructs you further. If you don’t already have one, she is most likely to suggest you get an editor to make your work pristine in preparation for publishing houses. You’ve workshopped and beta-tested your manuscript, been through a hundred revisions, and re-read your story ten times more than that. Grammar mistakes, spelling errors, even odd formatting, will all appear normal to you. Your work needs fresh, objective eyes. Do not take your manuscript back to workshops. Do not have a friend make further suggestions. Do not listen to your spouse who says that one scene in that one chapter should be changed. Be done. Otherwise you will find yourself wandering around on a dark stage, glowing in black light, listening to a bunch of conflicting voices telling you what to do, until you stand front and center, smiling on the outside and pouting on the inside. Worse, you’ll have spent money on an editor only to change your MS yet again. Worse still, your agent could get irritated and drop you. A dropped writer is labeled a difficult writer. A “difficult writer” can be a hard sell, even before her work is seen by a publisher. When it is show time, trust in your work, trust in yourself. You may not get a chance to be on the stage again. Yes, the picture gives me the willies – but the blog is right on. Good advice not only for writers, but for life’s difficulties in general.